an extension of the wearer's energies and needs. 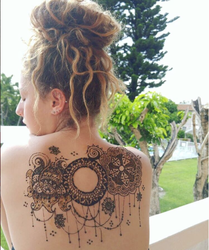 Henna can be a powerful healing process, an exciting celebration, or even a test for a permanent tattoo. All henna used in 100% organic and hand made. I am available for appointments throughout the week at my in home studio and on weekends periodically at my studio or at local events. I work based on appointments so please reach out to schedule a good time for us to meet. If you'd like to set an appointment for you, you + a friend, or even you + a few friends please contact me here. Pricing starts at $25 when you come to me, I am willing to travel for an additional fee. Thank you for considering me as your henna artist. I am incredibly blessed to pursue my passion while also adding a little more joy to your magical day! I am located in the South Florida region and serve from Orlando to Key Largo as well as travel for weddings in Cancun, Tulum, Playa del Carmen, all 48 US states, and the Caribbean islands. Thank you for considering me as your henna artist for your party or event! 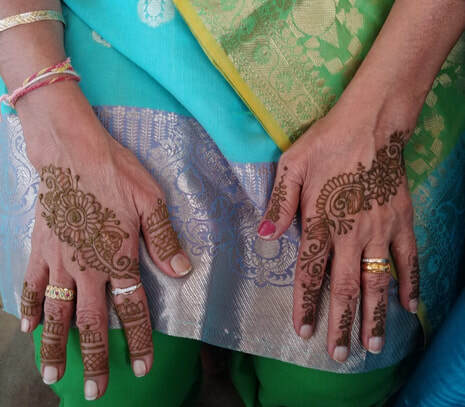 Henna is a great activity for bridal and baby showers, cooperate parties or events, or as the main attraction. 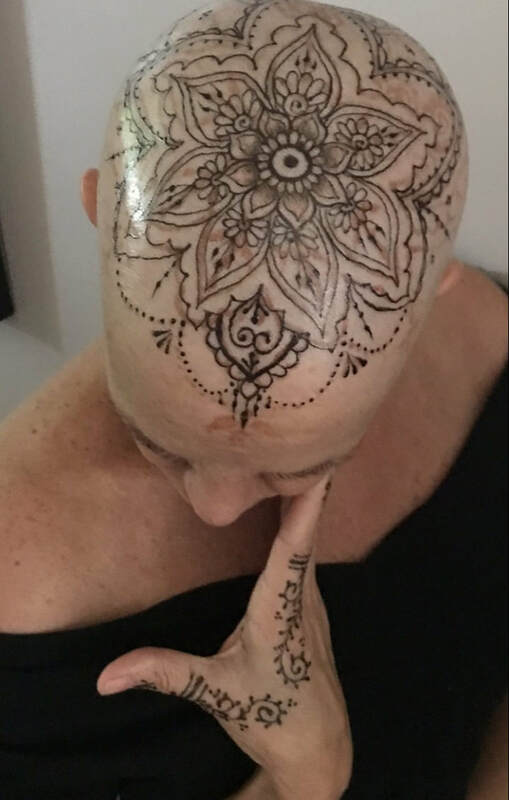 Henna or Jagua crowns at a discounted rate for chemotherapy patients or those with alopecia. Henna is plant leaf. To create a paste we grind up the leafing and mixed it with other natural ingredients like essential oil and lemon juice to create a paste. DO NOT USE IF YOU ARE ALLERGIC TO ANY FRUIT. Jagua is the nectar from a fruit, it is mixed with edible tree gum to create a gel like substance. 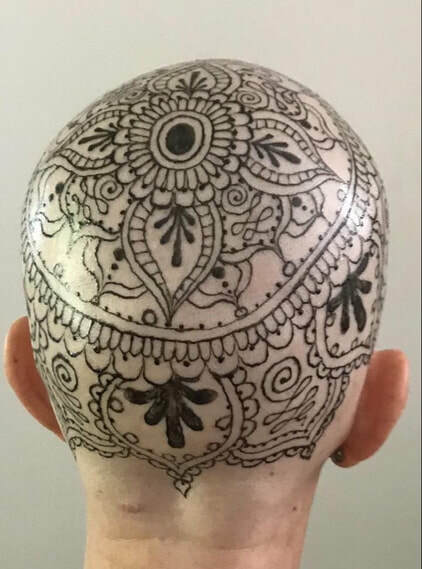 Henna and Jagua are largely different materials to work with so the pricing is adjusted accordingly. The size and area of the tattoo are also taken into consideration when priced, just like a permanent tattoo. Henna minimum is $20 while Jagua is $25. Do you have an idea in mind? If you do, send me an example photo or an explanation of what you're looking for and I will send you back a free quote! Contact me here. 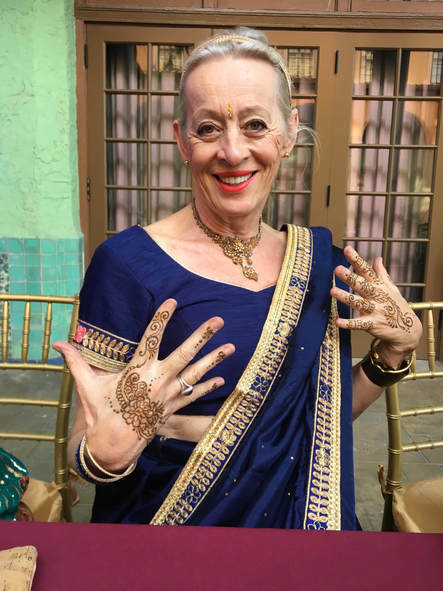 Are Henna and Jagua safe? YES! I use only ALL NATURAL materials so there is nothing to worry about. Because of the essential oils in henna, there can actually be a calming effect. Jagua must only be avoided if there is a fruit allergy already present. 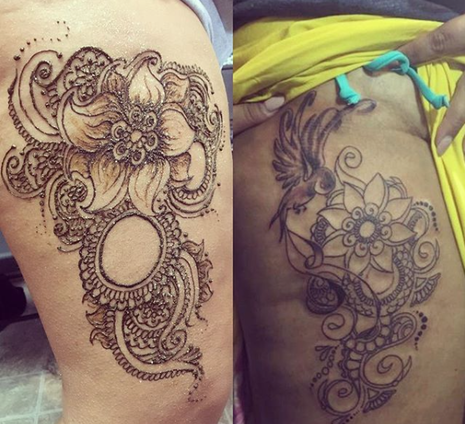 What is the difference between the Jagua and Henna? - Henna is brown in color and lasts about a 1 to 1.5 weeks. This artistry is traditionally found throughout Africa and Asia. - Jagua is blue-black in color and lasts about 2.5 to 3 weeks. This artistry is traditionally found in many regions of South America and the Caribbean. ​How does Henna work + How do I care for it? 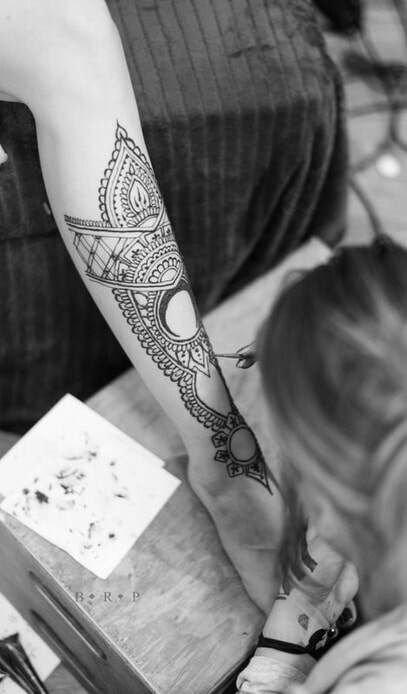 I will create a piece of work on top of your skin with the Henna paste. This paste will dry within 30 minutes and start to flake off, but keep as much as you can on your skin for as long as you can ( this will make it darker and last longer). STAY WARM, henna likes the heart while it develops. A stain on your skin will remain after the paste flakes off, and will need about two days to fully develop. Avoiding water on the henna stain as it develops is best, but if you can't avoid water for the next two days, go for at least 12 hours of no water after initial art is done. Again, the longer no water the better. Heat and sun will help your stain develop darker and more evenly, keep your henna stain moisturized with essential oil or lotion and try not to scrub at it when you bathe. Any exfoliation of the skin will cause the stain to fade more quickly. 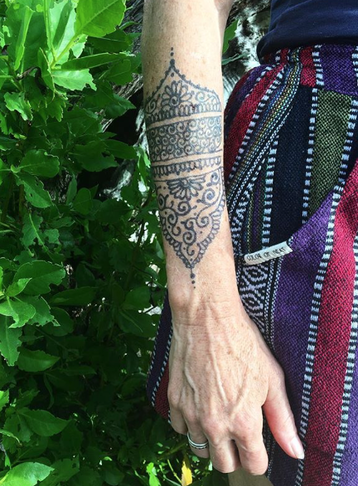 How does Jagua work + How do I care for it? 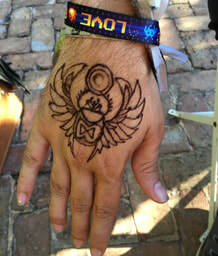 I will create a piece or work on your skin with the Jagua gel. This gel takes 30-60 minutes to dry, so be careful (the smallest touch of gel can instantly stain, but the stain develops overtime)! Once the gel is flat on your skin, it is dry, and will need to stay on your skin or at least 4 hours (8 hours is recommended). STAY WARM, jagua likes the warmth, but no sweating. Once the time is up, you can wash the jagua off with cold or lukewarm soap and water. What is left is a very light stain that will develop over the next day into a deep black color. Keep your stain moisturized and try not to scrub at it when you bathe. Any exfoliation of the skin will cause the stain to fade more quickly. Will this show on darker skin tones? Results can vary for everyone and the color of the skin doesn't have much to do with that variance. 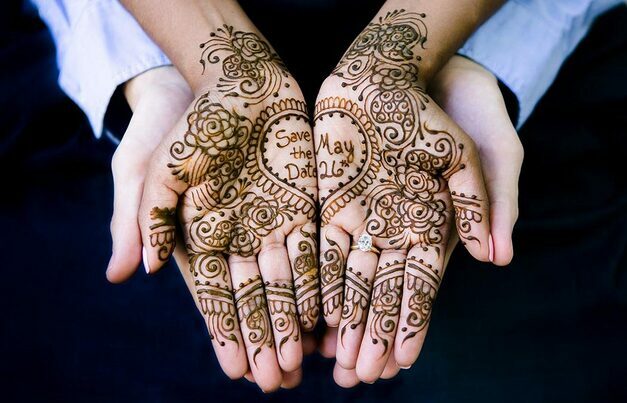 Both henna and jagua will show on darker skin tones but the darkness of the stain can be affected by many things. Body temperature plays a huge role (the hotter the better, that's why we suggest getting into the sun), as well as skin type, lifestyle, area on the body etc. This is mostly because of the many factors that come into play when dealing with an all natural substance. If you didn't achieve the results you had hoped for, try going over the design with a second application, or we choosing another location. If you are weary, before we apply the art let's talk about what you think might affect your chances of a dark stain. Do certain parts of the body stain better/longer? 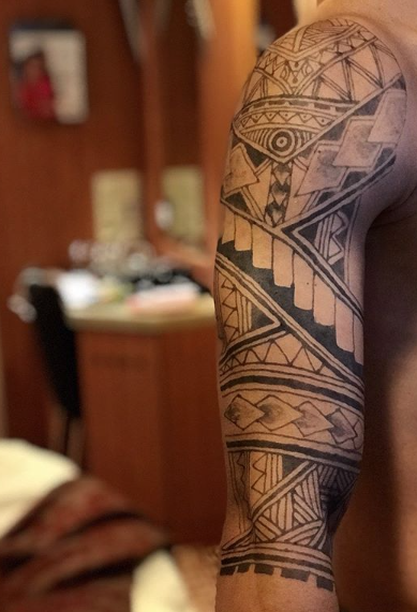 With both henna and jagua, areas of skin that are thicker are typically more receptive to the staining. This includes fingers, palms and sides of the hands, soles and sides of the feet. The face will stain only maybe 5 days since the skin is typically more oily and shedding faster than the rest of our bodies.